It has been suggested that this article be merged into Historical impacts of climate change. (Discuss) Proposed since March 2019. Historical climatology is the study of historical changes in climate and their effect on human history and development. This differs from paleoclimatology which encompasses climate change over the entire history of Earth. The study seeks to define periods in human history where temperature or precipitation varied from what is observed in the present day. The primary sources include written records such as sagas, chronicles, maps and local history literature as well as pictorial representations such as paintings, drawings and even rock art. The archaeological record is equally important in establishing evidence of settlement, water and land usage. In literate societies, historians may find written evidence of climatic variations over hundreds or thousands of years, such as phenological records of natural processes, for example viticultural records of grape harvest dates. In preliterate or non-literate societies, researchers must rely on other techniques to find evidence of historical climate differences. Past population levels and habitable ranges of humans or plants and animals may be used to find evidence of past differences in climate for the region. Palynology, the study of pollens, can show not only the range of plants and to reconstruct possible ecology, but to estimate the amount of precipitation in a given time period, based on the abundance of pollen in that layer of sediment or ice. The eruption of the Toba supervolcano, 70,000 to 75,000 years ago reduced the average global temperature by 5 degrees Celsius for several years and may have triggered an ice age. It has been postulated that this created a bottleneck in human evolution. A much smaller but similar effect occurred after the eruption of Krakatoa in 1883, when global temperatures fell for about 5 years in a row. Before the retreat of glaciers at the start of the Holocene (~9600 BC), ice sheets covered much of the northern latitudes and sea levels were much lower than they are today. The start of our present interglacial period appears to have helped spur the development of human civilization. Evidence of a warm climate in Europe, for example, comes from archaeological studies of settlement and farming in the Early Bronze Age at altitudes now beyond cultivation, such as Dartmoor, Exmoor, the Lake district and the Pennines in Great Britain. The climate appears to have deteriorated towards the Late Bronze Age however. Settlements and field boundaries have been found at high altitude in these areas, which are now wild and uninhabitable. Grimspound on Dartmoor is well preserved and shows the standing remains of an extensive settlement in a now inhospitable environment. Some parts of the present Saharan desert may have been populated when the climate was cooler and wetter, judging by cave art and other signs of settlement in Prehistoric Central North Africa. The Medieval Warm Period was a time of warm weather between about AD 800–1300, during the European Medieval period. 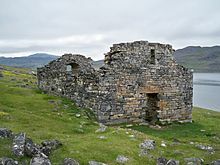 Archaeological evidence supports studies of the Norse sagas which describe the settlement of Greenland in the 9th century AD of land now quite unsuitable for cultivation. For example, excavations at one settlement site have shown the presence of birch trees during the early Viking period. The same period records the discovery of an area called Vinland, probably in North America, which may also have been warmer than at present, judging by the alleged presence of grape vines. The interlude is known as the Medieval Warm Period. "And in this same year after the 2nd of February came the severe winter with frost and snow, and with all kinds of bad weather, so that there was no man alive who could remember so severe a winter as that, both through mortality of men and disease of cattle; both birds and fishes perished through the great cold and hunger." The Chronicle is the single most important historical source for the period in England between the departure of the Romans and the decades following the Norman Conquest. Much of the information given in the Chronicle is not recorded elsewhere. The Little Ice Age brought colder winters to parts of Europe and North America. In the mid-17th century, glaciers in the Swiss Alps advanced, gradually engulfing farms and crushing entire villages. The River Thames and the canals and rivers of the Netherlands often froze over during the winter, and people skated and even held frost fairs on the ice. The first Thames frost fair was in 1607; the last in 1814, although changes to the bridges and the addition of an embankment affected the river flow and depth, diminishing the possibility of freezes. The freeze of the Golden Horn and the southern section of the Bosphorus took place in 1622. In 1658, a Swedish army marched across the Great Belt to Denmark to invade Copenhagen. The Baltic Sea froze over, enabling sledge rides from Poland to Sweden, with seasonal inns built on the way. The winter of 1794/1795 was particularly harsh when the French invasion army under Pichegru could march on the frozen rivers of the Netherlands, while the Dutch fleet was fixed in the ice in Den Helder harbour. In the winter of 1780, New York Harbour froze, allowing people to walk from Manhattan to Staten Island. Sea ice surrounding Iceland extended for miles in every direction, closing that island's harbours to shipping. The severe winters affected human life in ways large and small. The population of Iceland fell by half, but this was perhaps also due to fluorosis caused by the eruption of the volcano Laki in 1783.Iceland also suffered failures of cereal crops and people moved away from a grain-based diet. The Norse colonies in Greenland starved and vanished (by the 15th century) as crops failed and livestock could not be maintained through increasingly harsh winters, though Jared Diamond noted that they had exceeded the agricultural carrying capacity before then. In North America, American Indians formed leagues in response to food shortages. In Southern Europe, in Portugal, snow storms were much more frequent while today they are rare. There are reports of heavy snowfalls in the winters of 1665, 1744 and 1886. In contrast to its uncertain beginning, there is a consensus that the Little Ice Age ended in the mid-19th century. Through deforestation and agriculture, some scientists have proposed a human component in some historical climatic changes. Human-started fires have been implicated in the transformation of much of Australia from grassland to desert. If true, this would show that non-industrialized societies could have a role in influencing regional climate. Deforestation, desertification and the salinization of soils may have contributed to or caused other climatic changes throughout human history. For a discussion of recent human involvement in climatic changes, see Attribution of recent climate change. ^ Miller GH, Fogel ML, Magee JW, Gagan MK, Clarke SJ, Johnson BJ (July 2005). "Ecosystem Collapse in Pleistocene Australia and a Human Role in Megafaunal Extinction". Science. 309 (5732): 287–290. Bibcode:2005Sci...309..287M. doi:10.1126/science.1111288. PMID 16002615. This page was last edited on 8 March 2019, at 20:32 (UTC).